Gluten Free and Good For You eBook is filled with all kinds of Gluten Free tips and information to help you to either eat gluten free, or to be able to serve gluten free meals and snacks to family members and friends who have gluten free needs. 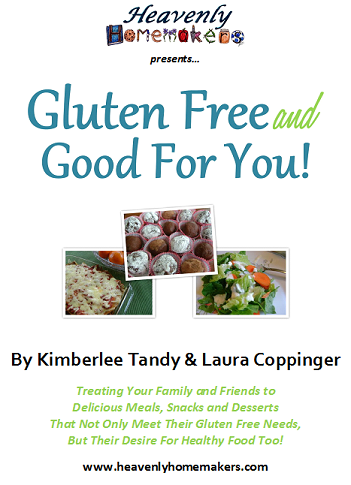 I have loved learning through my friend Kim (co-author of this ebook) such wonderful gluten free ideas so that I can fellowship with or take meals to my friends who are unable to eat gluten. Beyond all the great information this eBook contains, you’ll love all the great recipes! You don’t need any special or hard to find gluten free ingredients to make these recipes! All of the recipes include basic, every day ingredients that you’re likely to have on hand in your kitchen, making gluten free cooking easier than ever. I’ve included quite a few favorite gluten free recipes from right here on the Heavenly Homemakers site, plus Kim has added several of her tried and true family favorites. And I’ll say it again: Gluten Free or not…our family loves all of these recipes!! They’re healthy, they’re easy, they’re inexpensive…and they’re gluten free. 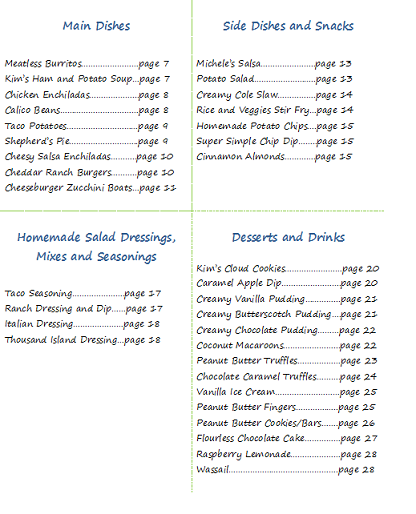 Pages 1-6 are full of gluten free information and tips, and then come the recipes!! This book is worth purchasing JUST to get Kim’s Flourless Chocolate Cake recipe. It is SO good! A big thanks to Kim for all your hard work with me on this eBook. Look out everyone…there’s already a gluten free eBook number two in the works!! Once you purchase, keep the window up as you’ll be offered a download link right away! Can’t say thank you enough. I am so excited to explore gluten free cooking. I have always wanted to but didn’t know where to turn for good recipes. I have tried almost all the recipes on this blog and am really looking forward to trying these new ones. Thanks again! None of the recipes call for white or brown sugar, but they do call for more natural sugars like real maple syrup, sucanat or honey. I have been following your web-blog for a long while now and I can empathize with you about Malachi’s eczema problem. My second daughter, Sarah was miserable from the day she was born. I was nursing her and she got eczema. Sarah’s eczema was over her complete body, so bad that she had it on her eye lids and her elbows and at one point because she was so miserable and it was so bad the Doctor told me to stop extending her arms out fully because they bled every time they were extended. We tried the usual elimination diet for me since I was nursing her..no luck, so he told me to stop nursing her and change her to formula. We tried EVERY formula on the market as well as going back in time to what was used when I was a baby; evaporated milk, corn syrup and water. That was the “formula” that was used in the 1940’s – mid 60’s. That did not work either. Next onto raw cows milk (by this time she was just shy of 6 months old),again – no luck. All she did from the time she woke up to the time I was able to get her to sleep at night (forget any naps or sleep during the day)was cry and it was a screaming type of cry. Finally on Good Friday the Doctor called me and asked if my local small town store carried a newer formula made with soy milk. I wasn’t sure so he told me to try any store within reason to get the soy formula. My local store actually had it and I started Sarah on it immediately. 3 days later, Easter Sunday, Sarah’s eczema was 75% GONE!!! Praise the Lord! What it eventually came down to was that Sarah was allergic to all animal protein. The elimination diet when I was nursing her does not remove animal protein from my diet, so that is why she could not handle me nursing her. All the other formulas were made from cows milk, an animal protein. The soy formula was truly disgusting and smelled awful but it worked. After about one month Sarah’s scars were even gone. Sarah’s skin was beautiful and soft like an infants should be. It took her about 4 years to be able to start eating small portions of any type of animal protein. The Doctor said that as she grew older she should out-grow the allergies; which she did for the most part. She is no a big meat eater but craves milk products like cottage cheese and even now at 29 years old, if she eats to much of it she will get a small patch or two but it does go away within a week or two of her stop eating the offending item. What I suggest, not only as a mother who has been through not knowing how to comfort your child because you don’t have the answer/reason your child feels the way they do; but as a dietitian as well. If you do not see major improvement in 4 weeks, my next step would be to stop the milk products. If I remember correctly, you get your milk from a farmer locally so it is not pasteurized and definitely contains more enzymes which can cause allergies in those that are more susceptible to having allergies. I know that there has been many great strides in Gluten-Free products, not only the availability of them but that they taste much better than just even a year ago. What most people do not realize is that if they are not gluten intolerant, they should not eat a gluten-free diet. An occasional meal or treat is ok but if someone eats gluten-free unnecessarily, it can actually create health problems for them. The long list of potential health problems is for another time. But it is not like going from a meat eater to a vegan. I will be praying that you and your Doctor can finally find the cause of Malachi’s eczema and that it clears up quickly. Please feel free to email me if you have any questions or concerns. I also want to thak you for your blog and all the time and effort that you put into it. It shows that your heart goes into each blog…please keep doing Gratituesdays, I believe that we all need to stop, take a breathe and see exactly how Blessed we really are. Definitely next on my list will be to eliminate dairy to see if that is what is causing the issue. We thought we’d do one thing at a time this time to see what made a difference. I’m so glad you found what was causing your daughter’s terrible struggle!! Question: Are many of these recipes also egg-free? I’d like to know before purchasing because I recently discovered an allergy to eggs and peanuts in my son. He and my daughter also have pretty bad eczema, so I’m interested in trying gluten-free to see if that helps. So far, eliminating eggs hasn’t changed the eczema problem. Thanks for your help! With a quick count, I found that about 25 out of 35 recipes are eggless. Several of the dessert recipes call for eggs, but most of the main dishes and side dishes are egg free, as are all of the seasonings and a few of the desserts. Hope that helps! I just purchased the book and my browser closed after sending in the payment–I’m afraid I’ve lost the download link! What can I do? I can send you the invoice number or any information you need to verify my payment. How can I retrieve the download link? We have some gum (xantham, guar, etc.) allergies that run in our family. Do your gluten-free recipes include gum? No, we were very intentional about not including anything like that – only basic, real ingredients that any and everyone has access to!